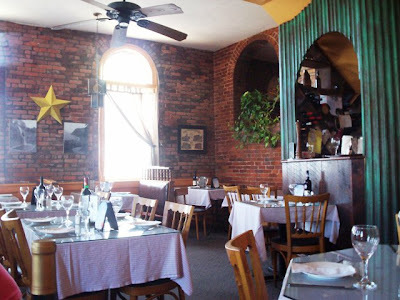 Armed with our $10 gift certificate from MenuJoy, Laura and I made the quick trip to New Bedford to dine at INNER BAY RESTAURANT. Now this wouldn't be our first visit here. 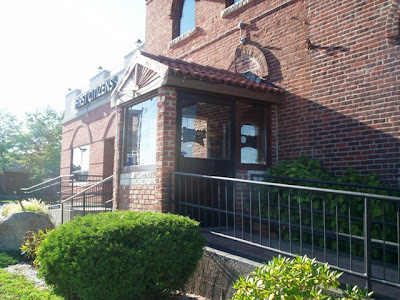 We had come here for lunch, maybe a year or so ago, and left a little disappointed. Not with the food, which was delicious, but with the lunch-time selections. 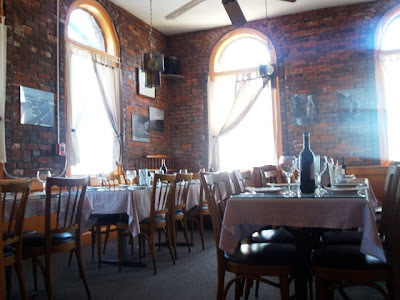 The lunch menu is quite small with only a couple of appetizers, sandwiches, salads or entrees. Since our mid-day meal is usually our dinner, we were looking for something a little more substantial. Then we had the brainstorm. We called ahead to see if we could choose from the dinner menu instead, even though it would be early afternoon. Assured we could, we set off for the restaurant. We arrived around 3:30 p.m. on a very lovely Saturday and pretty much had the place to ourselves. I had forgotten how pretty this place was. All wood and white tablecloths with a continental flair. There were only two other occupied tables so we were able to take some great pictures. It was quiet now but I've heard this place is very busy at night. Besides the great restaurant, they have a fantastic bar area and now have outdoor seating as well. Our very nice waitress Judie seated us immediately and handed us the lunch menus. Uh oh These were the menus I remembered. Only a few options were offered. I really do understand this. If you don't do a big lunch business why have a big prepared menu. But we wanted dinner. So I got very brave and when Judie came over I asked if we would be able to order from the dinner menu. She seemed surprised but immediately said , " Let me check ". She came right back with two dinner menus and the two Diet Pepsis we had ordered. 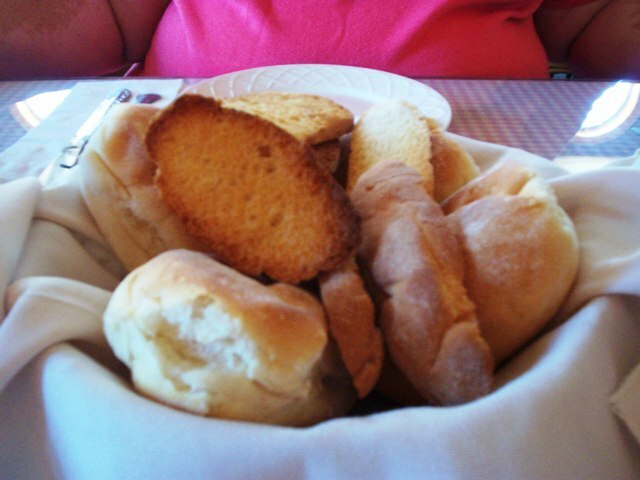 She also brought a great bread basket that contained 4 soft Portuguese rolls and several slices of toasted baguette. Now this is what I'm talking about. The dinner menu is extensive . They have kale & caldo verde soups , among others. 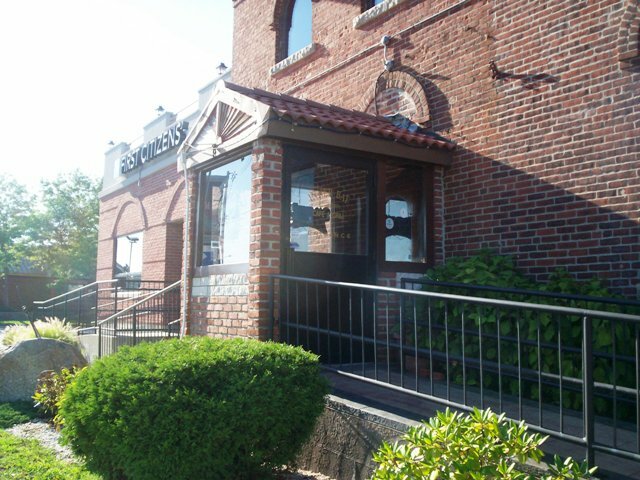 They serve several appetizers such as shrimp cocktail, calamari, littlenecks, mushroom caps and kid favorites: potato skins & chicken tenders, plus much more. They have all manner of meats, fish and seafood . Just a few: carne alentejana, prime rib, lombo de porco, bacalhau silmo and seafood sampler and much more. Click on their website above for the full menu. Laura and I immediately knew what we wanted as an appetizer ....CHOURICO BOMBEIRO. 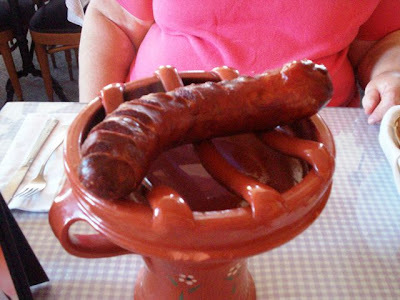 This was described as flamed, homemade, hot spiced chourico. We've been dying to try this. We ordered this and I ordered fish & chips and Laura chose a special Judie told us about ....FILETS NO FORNO. 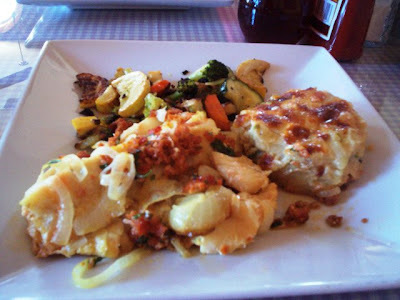 This was a beautiful cod fillet with chourico, onions and grilled veggies. We had a selection of soups and salads to go with our meals and I chose a salad with French dressing and Laura chose the kale soup. 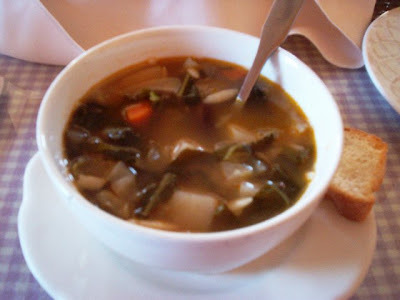 In a few minutes our soup and salad arrived. 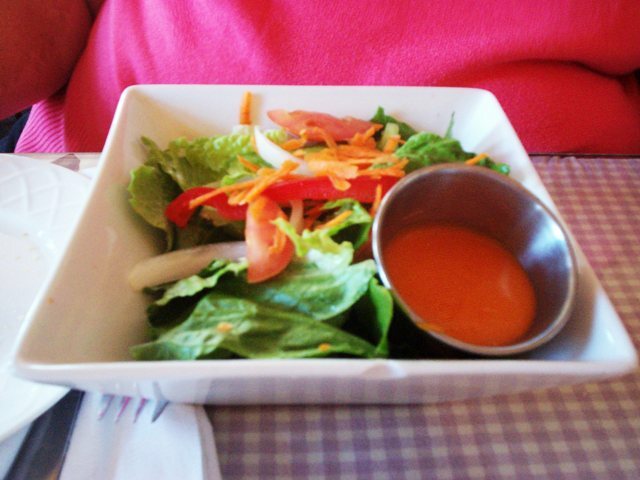 My salad was very fresh and crisp and the dressing had a nice tang to it. Laura loved her soup especially since it was all veggie. But lest you think it was thin or watery ...it wasn't. It was filled with kale and potatoes and the broth was nicely spiced. She really found it flavorful. We ate these along with our bread basket items. What a great start to our meal. We had just finished when out came our flaming chourico. What a great presentation. A whole tube of chourico, sliced partially through and spread apart, placed over a pottery kiln with flames lapping at the meat. I was so excited. lol Judie said to just let the flames die down and we're ready to go. Flames gone, we cut the meat in two and then finished cutting the slices on our individual pieces. It was delicious. Spicy ( but not too much so), very meaty and lean ( as lean as chourico can get ), and tasting grilled and smokey. We'd been wanting to try this and we weren't sorry. I would get it again in a minute. Judie came to take the little kiln and clean off the table and then bring out our meals. I have to say this was one of the best fish & chips I've had in a long time. Two fillets, done perfectly, a very light ( beer-flavored ? ) batter that was thin & crisp and great shoestring fries. Along side were tartar sauce and cole slaw. I had been off fish for awhile because the quality just wasn't there. But this brought me back. Laura had an amazing cod fillet baked with chourico & onions and served with grilled vegetables and a "mystery" patty. At first she thought it was a cod fish cake but it tasted like potato. When Judie came over to see how everything was ( she did this with each course ) Laura asked her what the patty was. It was scalloped potatoes. 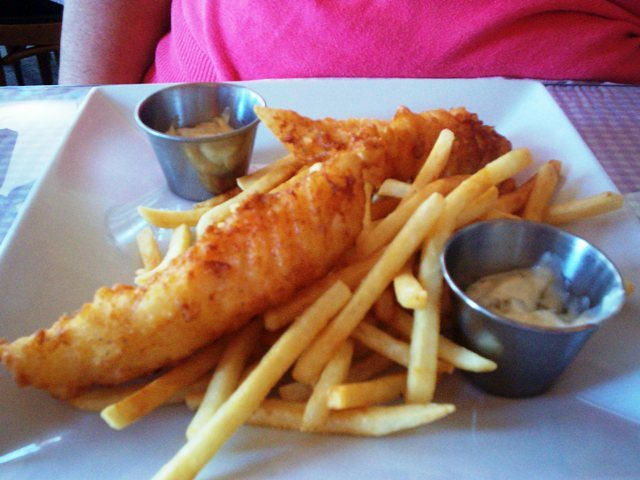 They must have been roasted along with the fish and thereby picked up the wonderful flavors. Laura declared her whole meal outstanding. Judie came by and asked if we'd like a refill on our sodas and we did. As we finished our meals we decided to go all out and order dessert. So when Judie brought back our refills, we ordered two flans. They were presented beautifully ( like everything else had been ) . 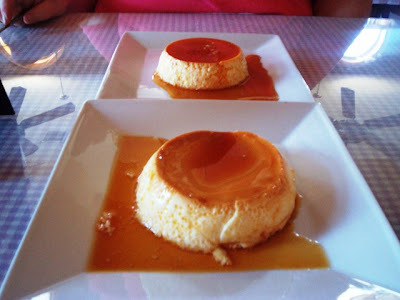 They were large and covered in caramel sauce, ice cold, very creamy and Judie told us they were homemade. We believed it. What a perfect end to our fabulous feast. Basing a 20% tip for Judie on this total (before our $10 certificate) we had a grand total of $45 with tip. Then minus our $10 certificate it cost us $35. Not bad at all. P.S. Both Laura and I checked out the ladies room ( as we usually do for our reviews ) and were a bit surprised to find it lacking T.P. Also the lock is a struggle and once locked securely , you can't get out. Fact is, it looks like it could use some sprucing up. It doesn't fit in with the rest of the lovely restaurant. 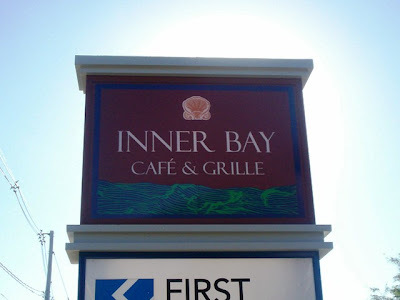 Inner Bay Restaurant is open from 11:30 a.m. to 9 p.m. Sunday through Tuesday and Thursday, and 11:30 a.m. to 10 p.m. Saturday and Sunday. 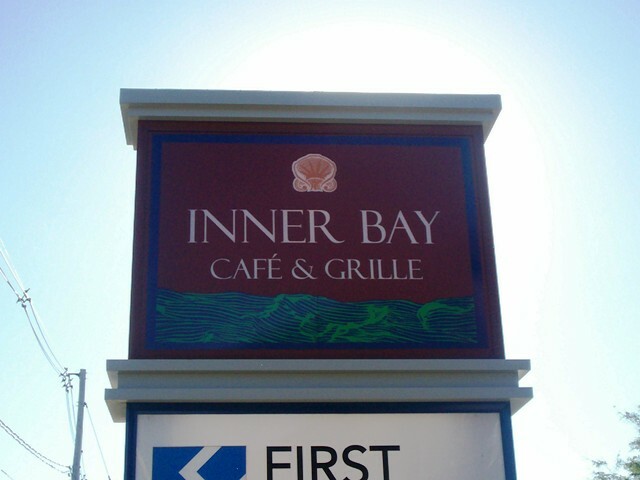 Inner Bay is closed on Wednesday. Don't forget to check out MenuJoy.com for loads of area menus.